Chiropractic is a health profession concerned with the diagnosis, treatment and prevention of mechanical disorders of the musculoskeletal system and the effect of these disorders on the function of the nervous system and on general health. There is an emphasis on manual treatments including spinal manipulation or adjustment. By restoring normal function to the musculoskeletal system, chiropractors can play a major part in relieving disorders and any accompanying pain or discomfort arising from accidents, stress, lack of exercise, poor posture, illness, and everyday wear and tear. Chiropractors take a holistic approach to health and well being. This means that they consider its physical, psychological, and social aspects. Chiropractic adjustment is the art of introducing a specific force in a precise direction, applied to a vertebra that is subluxated, i.e. not moving properly. Dr. Morgan identifies the location of these spinal/joint restrictions by motion palpation and determines the exact direction and the best way to correct the positioning. 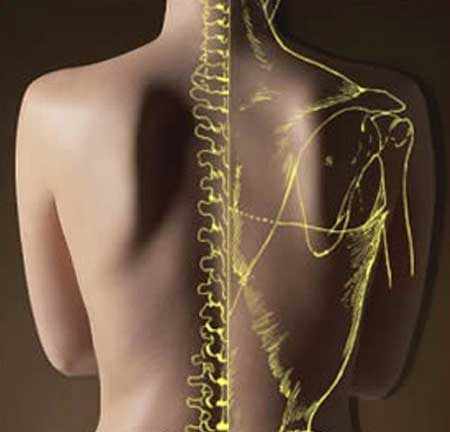 The adjustment frees-up the restricted vertebra and restores proper range of motion and normal alignment. This directly relieves stress and tension from the surrounding musculature and helps alleviates pain. The adjustment is very specific and will vary from Chiropractor to Chiropractor as well as patient to patient. The benefits of Chiropractic can help people of all ages, from infants to the elderly. What Is That "Cracking" Noise? Your joints contain fluid that helps keep them healthy and lubricated (like oil in a car). This "synovial fluid" contains gas (like carbonation in soft drinks). When an adjustment is made you may hear a noise. This is known as an "audible release" and is simply the release of gas in the joint much like when you open a can of soda. Chiropractic is a natural approach to better health and has an excellent safety record. For this reason, the insurance premiums for Chiropractic malpractice are very low. 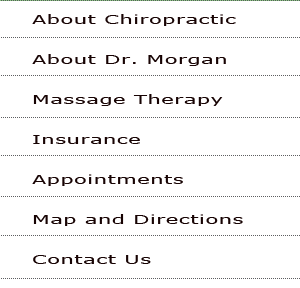 Before starting any kind of treatment, Dr. Morgan will explain the procedures and reveal any potential risks involved in taking treatment, delaying treatment, or not taking treatment at all.